At Saturday Morning Knitting Workshop today Janie asked me how I changed the ruffle on my version of the ever-popular Summer Flies Shawl….I went to the Skein Lane blog only to remind myself once again that I still had not posted photos. Here goes! Several of us in the local knitting communities embarked on this shawl…early in 2011 Kimberly saw someone wearing it and she “jumped’ right on the pattern and offered classes in the making of this shawl. I jumped on it as the shawl to knit my nephew’s girlfriend Carly….I had one in mind that I started last Christmas… it just didn’t seem like the right one for her. I was determined to knit one quickly…which turned out not to be quickly because I kept side-tracking on other knitting projects. However, I was determined to get done before the next Christmas… I did…how’s August for a delivery date? I knit my version – Carly’s version – with MaggiKnits linen, a ribbon yarn, and Crystal Palace’s Waikiki. I had been “warned” about one of the stitch patterns being fiddly. ( K3, YO, K4, (K1, YO, SL1, K2TOG, PSSO, YO, K3) 15 times, K2, YO, K3). I love “plain old” Susan Bates circulars but they weren’t working for this project with the 3 plies of MaggiKnits linen. Kimberly suggested that I consider a needle…name starts with a C…and darn if I kept the label or can remember the name….maybe Kimberly can help us out here. Anyway, what a difference…a sharp point and my knitting once again became a pleasure. 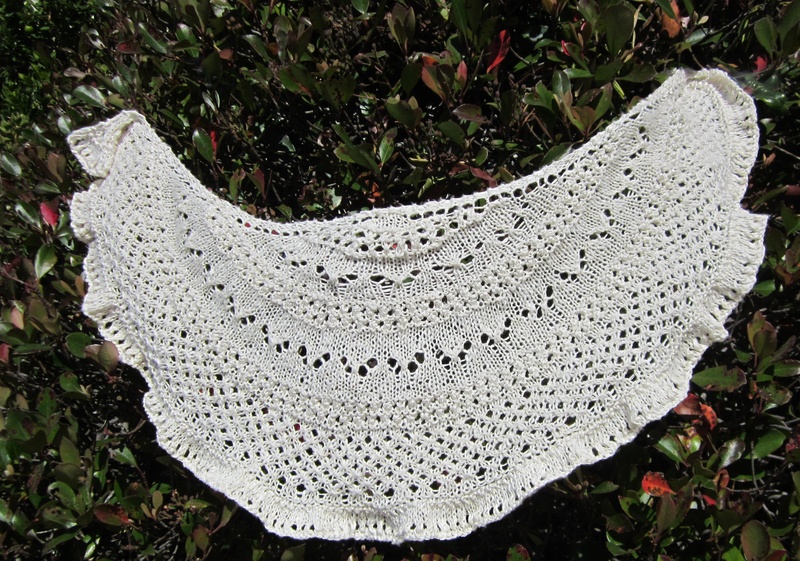 Tomorrow I will post the other renditions of this great shawl…dreaming about one for me! Toast the New Year with some recent knitted showings! During this past month of December we saw some beautiful garments at the Friday Knitting Workshop Group. Janie was wearing her “Jeweled Mini-Poncho“….Bonnie was wearing the “Daybreak scarf/stole“…Kimberly donned a couple hats (hats will be posted on their own). We’ve seen Sarah in her “Santa Hat“. Sheri showed her recently finished fingerless gloves “Pluviose“…I have been inspired to knit these for my sister Betty. She’s seen the pattern and knows they are coming. Finished one today. I might be able to deliver by Thursday when I meet up with her. Connie finished and showed two lovely baby sweaters inspired by the Surprise Sweater pattern that comes to us from Elizabeth Zimmerman. Just today Kimberly posted that she is embarking on this garter pattern…what’s unusual about this is that she does not love the garter pattern…ironically, I too, am embarking on that same pattern. Bill’s granddaughter is having her first born at the end of the month…so I better get “cracking” with getting this sweater done. Oh….knit, garter, knit, garter…I will be done!! Jan has been seen wearing her Summer Flies Shawl. That too will be a separate posting….several other folks have knit this beautiful shawl including myself and I forgot to post…what the heck?! This lovely shawl was brought to our attention by none other than Kimberly. So…let’s enjoy…there is so much to share!
. We are designers and knit handmade items…as they say…we rock!